Borjomi - spa and climatic resort in Georgia. Located in the southeastern part of the country at an altitude of 800 meters above sea urrovnem. The resort is surrounded by mountains covered by coniferous and deciduous forests. 1854 construction of the first draft of the plant was started. Today, the resort Borjomi built motels, hotels, public gardens and parks. its in the complex of monasteries Nedzvi and Likani. The monastery was built on the border of IX and X century, Christopher and Teorodom - disciples Archimandrite TaoKlardzheti St. Grigol Hantsteli.. After this has been repeatedly looted and only XIIXIII century Georgian King Alexander Didi ( "big") began to re-colonization of the region, and the reconstruction of monasteries was undertaken lordomfeodalom Borjomi - Kisvarda Avalishvili. Since the XVI century, the entire region of Samtskhe and Borjomi district have been occupied by the Turks (1578), and only in the XVII century were returned to Georgian control, but little or no population. The full restoration of the Green monastery began only in 1978 and ended in 2002. Akhaltsikhe City, (formerly known as Lomsiya), is the administrative center of the region Samtskhe-Javakheti and Akhaltsikhe region. The city is located in Akhaltsikhe Basin, on the banks of the river Potshovi, at an altitude of 1000 m. Above sea level. seas. Historical sources Akhaltsikhe referred from the XII century, with the old name Lomsiya. In Akhaltsikhe, where the old part of the city, you will visit Rabat and the so-called great fortress, in which the old days was the palace of the rulers of Akhaltsikhe. In Rabat, special attention is attracted by the old "Facilities". In Akhaltsikhe Rabat fortress existed halls specific type of Meskheti. Up to now from Rabat preserved bath and several buildings in the form of the ruins of the fortress itself was built on a high rock massif. The citadel stands on the eastern hill, and a large sweeping staircase connected to the large lower dvorom.Vnutri fortress, except for a few buildings that have reached our days. other ancient monuments were not preserved. It preserved the old church of Agia Marina, which in 1865 was re-built. the remaining other churches date back to the XIX century. 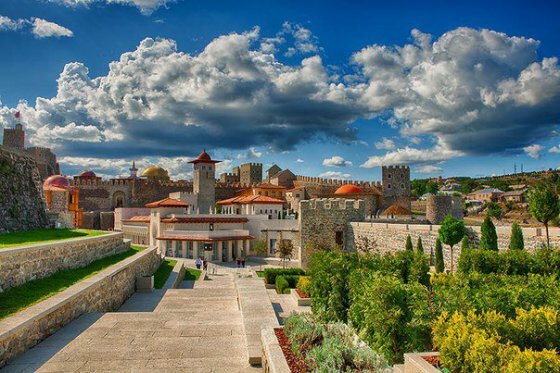 Just beyond the village of Aspindza You can see the powerful fortress of tall towers Khertvisi. It was built on a rocky cliff at the confluence of the Kura and its Paravani inflows. The architects who built the fortress, able to create not only a first-class military facility, but also a magnificent architectural monument. Despite the fact that there is a lot of buildings, created in different periods, yet the unity of the whole ensemble is not broken. 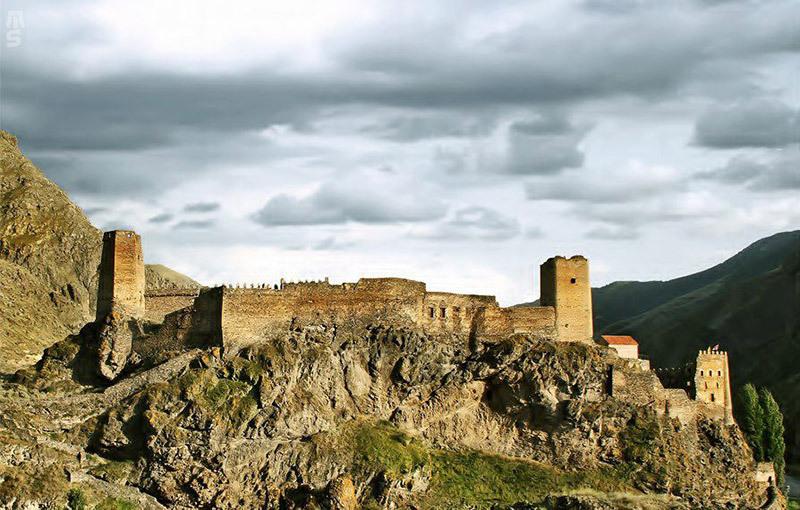 Castle ensemble complete the rocky fortress utёsy.Osnovnye structures relate to the period of developed feudalism and to the initial centuries of late feudalism (X XII centuries). There are also a small annex XVI XVIII vekov.Krepost mostly consisted of extensive fencing and the citadel. Today, from the fence were small fragments. Among the powerful structures. 12th century, among which there are also images of King George III and Queen Tamar. other rooms were "naked." Today, tourists can see for more than 100 rooms and stroll through several winding cave tunnel.